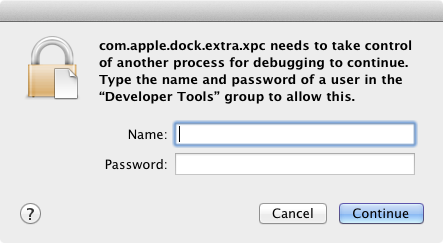 com.apple.dock.extra.xpc needs to take control of another process for debugging to continue. Type the name and password of a user in the "Developer Tools" group to allow this. No problem, I thought, and entered my credentials. Alas, to no avail. My name and password were rejected, which had me a little panicked at first, because I thought the OS upgrade might somehow have botched my account, potentially locking me out of my Mac later. Hitting cancel would only get rid of the message for a few seconds, then it would reappear, again and again. Turns out the solution was quite easy: Go the Mac App Store and download Xcode 4.1. 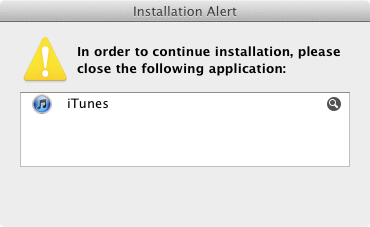 Once the installer has finished downloading, run it to replace the Snow Leopard version of Xcode 4.0 with a Lion compatible one. Once that is done, the message will not appear again. Please note: Maybe I could somehow have fiddled with my accounts privileges and group memberships, but as I needed Xcode anyhow, installing the correct version seemed the logical thing to do.